If you love bacon (and hopefully you do), you’re going to love these Turkey Club Wonton Cupcakes. 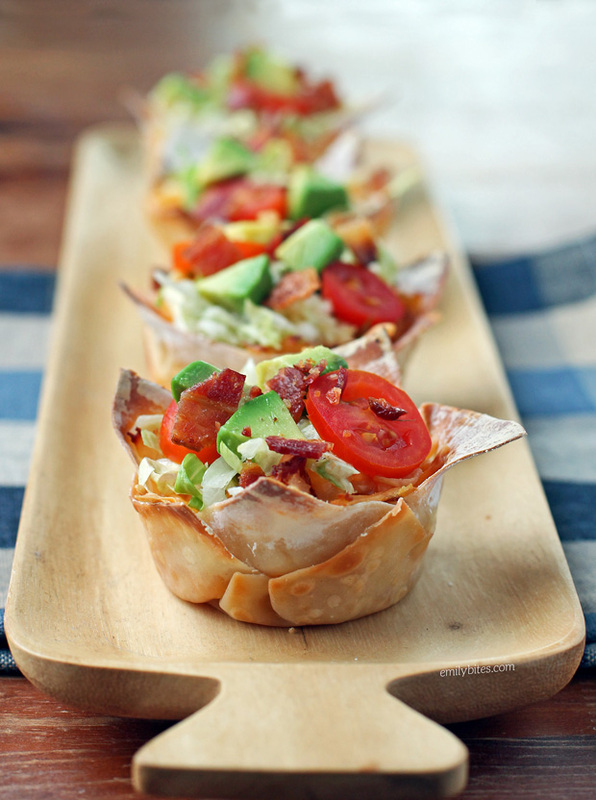 It’s all the flavors you crave from the traditional sandwich, stuffed between layers of wonton wrappers and served warm with a sprinkling of lettuce, tomato, avocado, and more bacon. I actually thought the flavors were similar to my BLT Dip, and since that’s one of my favorites, these cups were a home run. I skipped the mayonnaise that’s typically involved in a turkey club and replaced it with creamy cheese wedges and a bit of mustard. I think you’re going to love the results! In a microwave-safe mixing bowl, combine 6 slices worth of the chopped bacon, the chopped deli turkey and chopped cheese wedges and stir together. Place the bowl in the microwave and heat on high for 1 ½ minutes until contents are warm. Use a spoon to mix contents and smush the cheese wedges until they’ve coated the meat. Mix in the mustard. Push a wonton wrapper into the bottom of each of the sprayed cups in the muffin tin. Using about half of the turkey mixture, spoon evenly into the wonton wrappers. Sprinkle about half of the shredded cheddar evenly over the top of each cup. Press another wonton wrapper on top and repeat the layering steps with the remaining turkey mixture and shredded cheddar. Bake for 18-20 minutes until the wontons are golden brown and the contents are heated through. Remove the muffin tin from the oven and allow to cool for 1-2 minutes. Top each cup with a tablespoon of shredded lettuce and sprinkle with tomatoes, avocado chunks and the remaining 2 slices worth of chopped bacon before serving*. *Avocado exposed to the air will turn brown, so if you’re not serving all the cups at once you may want to hold off on the toppings and add those just before serving. OMG! These are delicious and super easy to put together! Totally in love ❤️ Thank you!!! Just want to clarify…these are double deckers with the meat and cheese between and again on top of the wonton? I am a long-time fan of your blog and have NEVER had a bad recipe. In fact, my husband and I have pretty much loved everything we’ve ever made. I have referred so many people to your blog. We especially love your entree cupcakes and muffins! We’ve probably made a half dozen different kinds. (We are Team Chicken Parmesan!) Anyway, I have been having dreams about eating dinner cupcakes for the rest of my life, and you have inspired me to make a couple originals. I have a recipe for Cuban cupcakes all figured out based on your recipes (but have not made them yet), and the idea of a muffuletta cupcake came to me this evening! However, part of my doesn’t want to disrespect the muffuletta by using Laughing Cow cheese (despite how much I love it) instead of its true cheeses. Do you think that some shredded cheese and the olive tapenade would suffice to bind the meat mixture? Would it work better if an egg white was added? OR do you think the oil from the tapenade would soak through, ruin everything, and I should just stick to the tried and true Laughing Cow method?